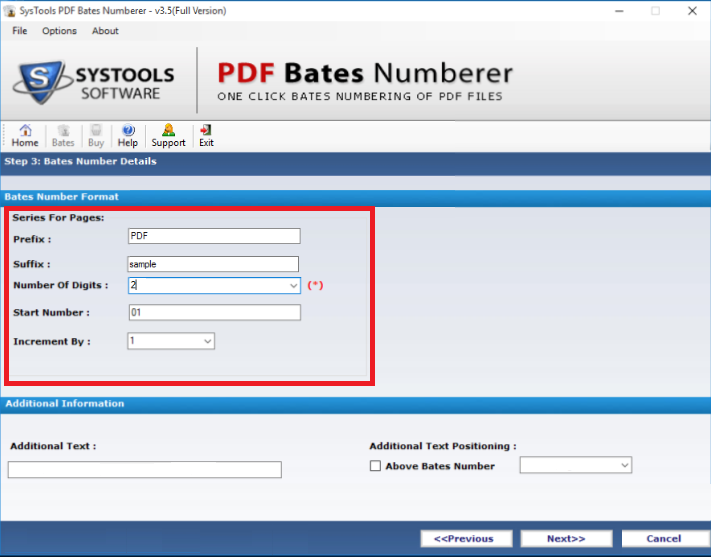 With the help of PDF Bates Numberer software, it becomes easy for a user to add Bates number, Bate stamp or page number to PDF in various ways. 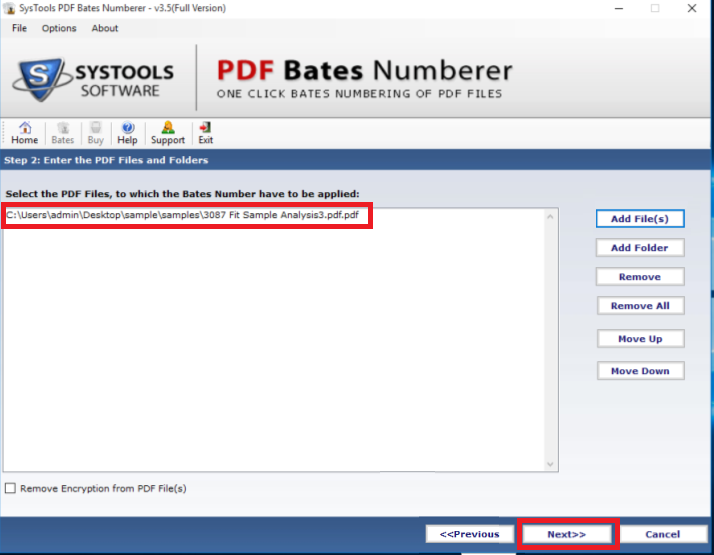 Moreover, a user can easily assign Bates numbers to multiple PDF files in batch. The tool offers users an option to add PDF files or folder with multiple PDF files. In addition, to arrange the order of PDF file the tool provides Move UP & Move Down options that one can use. 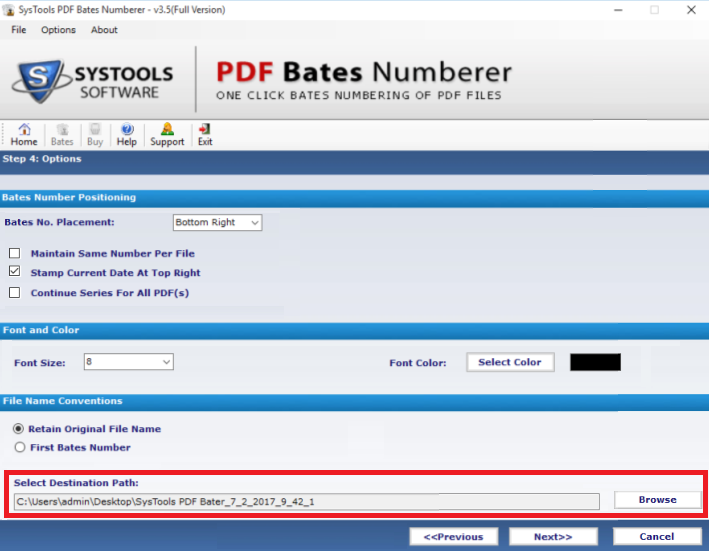 One can choose any of the styles to add Bates Number in the PDF file document. Moreover, if they want can print the PDF file also with page numbers. Additional Text: This option allows users to add some confidential text or information on each PDF document. Additional Text Positioning: Apart from adding additional text, a user is also allowed to set the position of added text on the PDF file i.e. Top Right, Bottom Right, Top left, and Bottom Left. Keep Original File Name: If a user wants can save the resultant PDF document with its original file name. 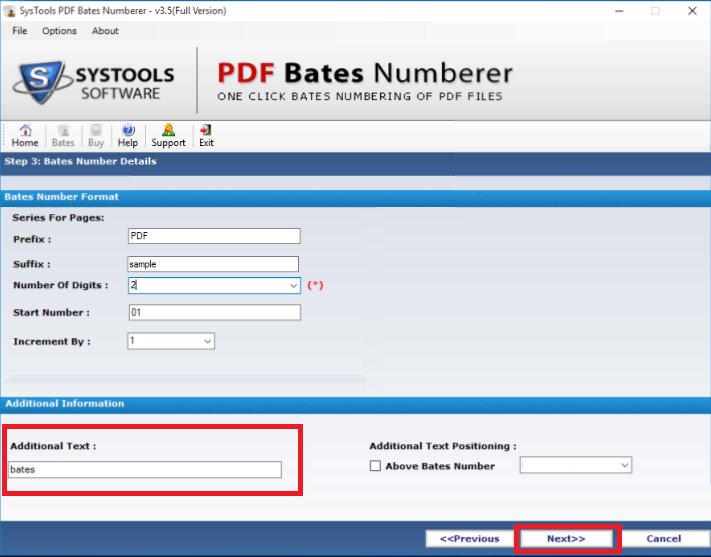 With First Bates Number: If a user wants to save PDF file with the first Bates number that is used while setting the Bates number, then go for this option. A user can use this software to add page number to PDF document and if wants can set the desirable font size of their choice. In addition, it is really easy for a user to change the color of the font for the Bates number. Moreover, it also allows users to highlight the PDF Page number in order to make them look more attractive on the pages. 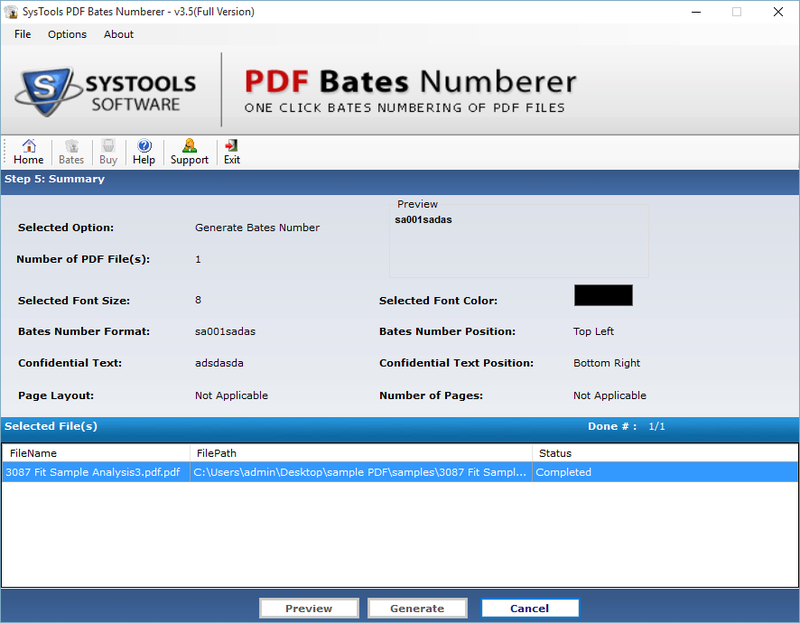 While adding Bates number on PDF file(s), the tool will display a small summary of the process. It generates a complete report of all the preferences and all other options that are selected by the user such as color, Bates number position, font size, etc. Moreover, it also shows a complete status report of the selected PDF file. Is it possible to add stamp Bates Numberer to multiple PDF documents? 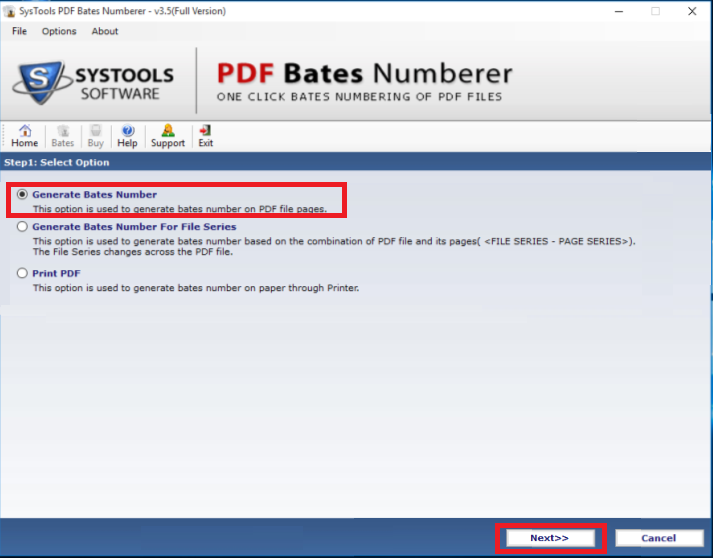 Yes, a user can easily add stamp Bates Numberer to PDF file. 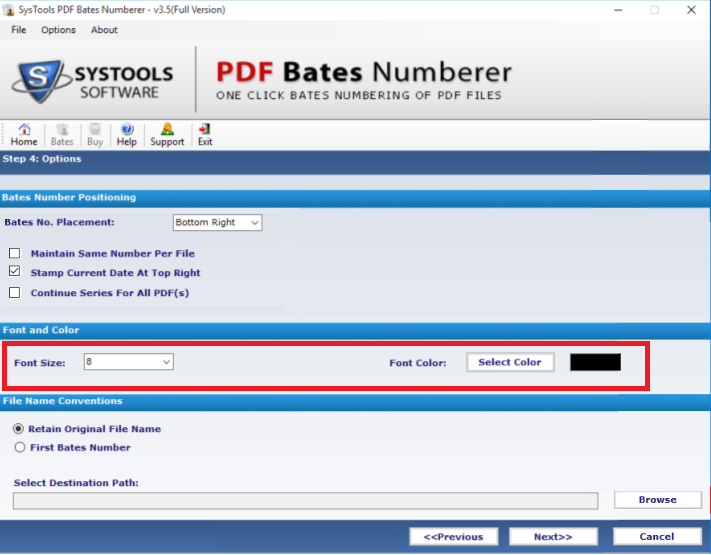 The PDF Bates Numberer either add an entire folder of PDF files or multiple PDF files at once. 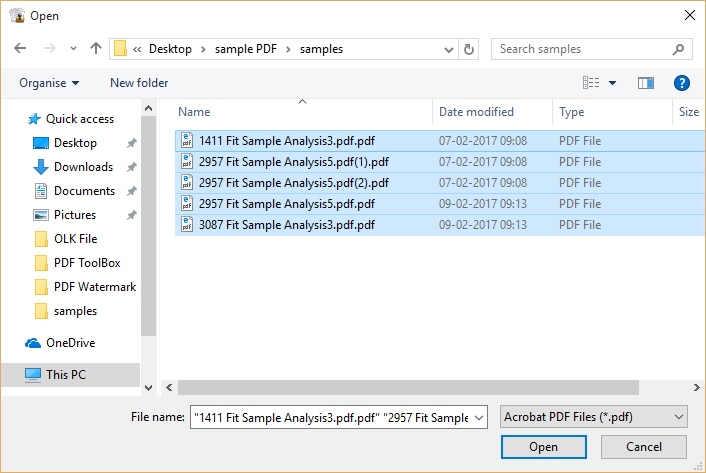 Does the tool maintain the integrity of PDF file data? Yes, it maintains data integrity even after adding Bates Numbers. It does not alter any data maintained in it. 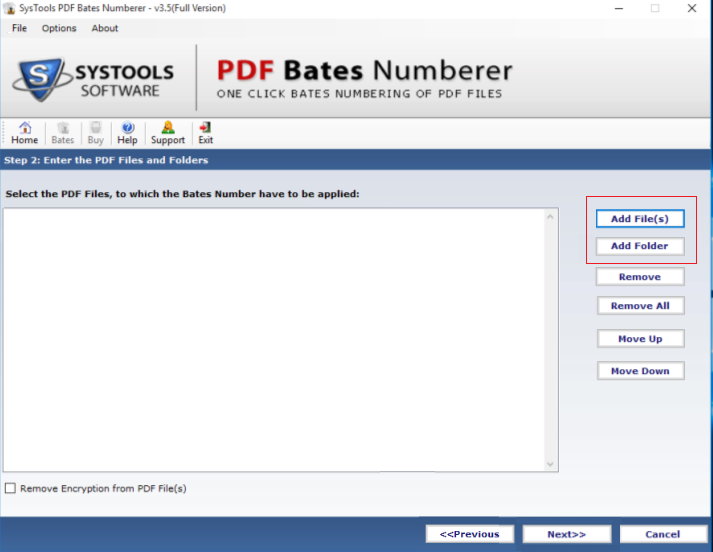 Can I save the PDF files with Bates Number with its original name? Yes, a user can choose Retain Original File name option to save the PDF files with older name only. Is it possible to add page number to PDF file without installing Adobe Acrobat on the local machine? Yes, It is possible to add Bates Number to PDF document without Adobe Acrobat on the local machine. Does the PDF Bates Numberer is compatible on Mac OS X platform? No, the tool is a completely windows-based application. A user cannot use it on Mac OS X. 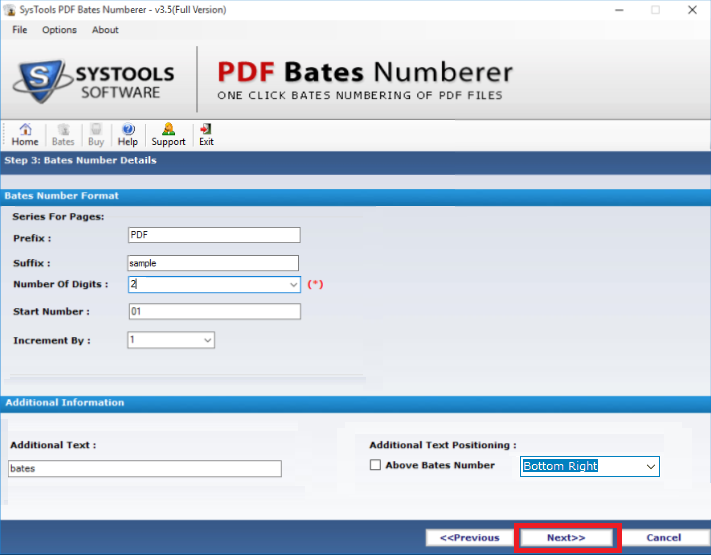 Generate Bates Numberer: If a user chooses this option then, it adds Bates number to selected PDF document. Generate Bates Number for File Series: If a user is having a combination of PDF file series and file pages, then select this option. The tool generates a page number to all the pages & files maintained in the selected folder. 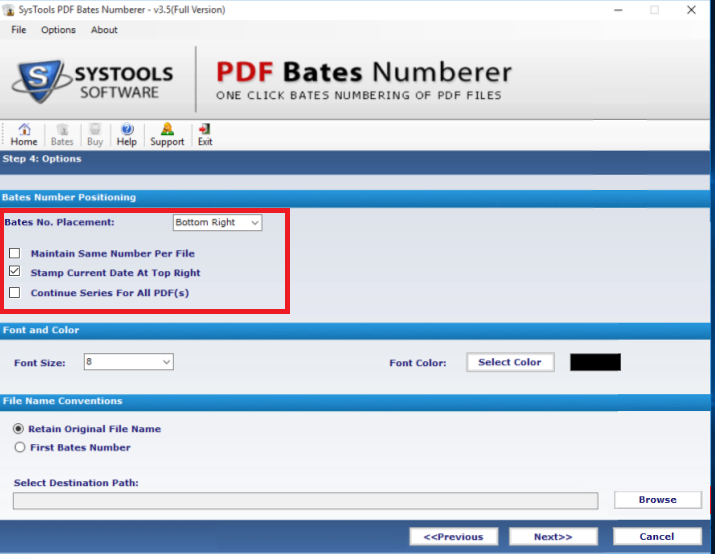 Print PDF: One can go for this option if he/she wants to take the print of the PDF file with Bates numbers. 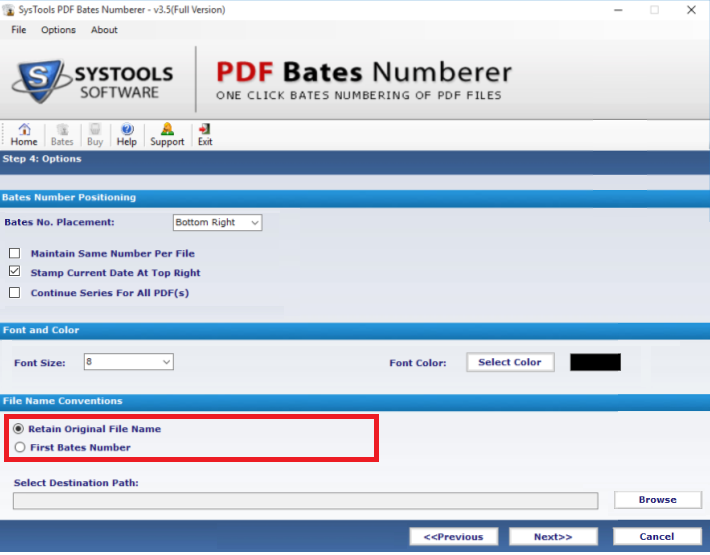 After previewing, click on Generate option to begin the Bates numbering process of your PDF. 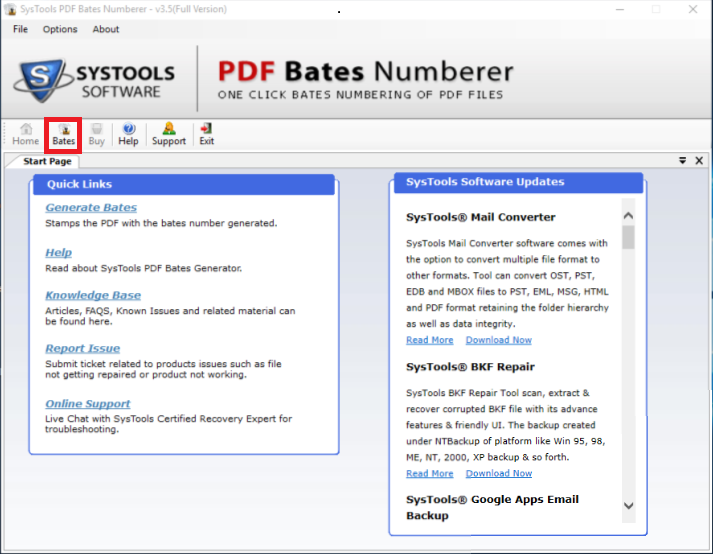 "I have Tried this PDF Bates Numberer tool and I must say that it is an amazing utility with so many advanced features. Bates Number formatting options I liked the most. 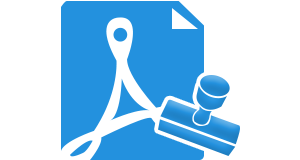 It helps in making the complete document more prominent to the users. Thanks to the developer for developing such a great utility. I am definitely going to suggest this tool to my friends also." "What an ultimate utility designed by the developers. 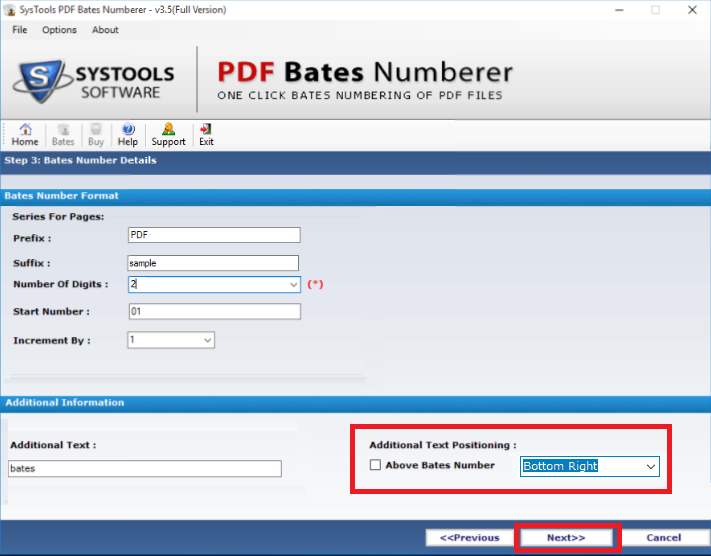 I never thought that adding bates number to the PDF file is so easy to process with the help of this PDF Bates Numberer software. Moreover, the feature that attracts me most toward this tool is that after adding bates number one can print the PDF file on paper also. Thanks to all teams of the software fro such a great help."